An under-performing tree that does not have any growth from year to year and seems to be ‘frozen in time’, needs to be air-spaded so that the root structure can be examined. 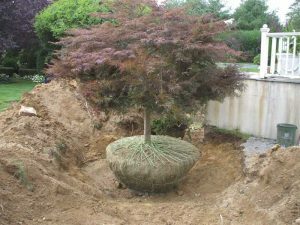 The most prevalent act of negligence by landscapers on Long Island is to leave newly planted trees inside the burlap sack or wire basket that encloses the root ball. The tree above has a healthy root structure. There is no sign of root damage and there is plenty of room for the roots to spread out, resulting in healthy growth from year to year. 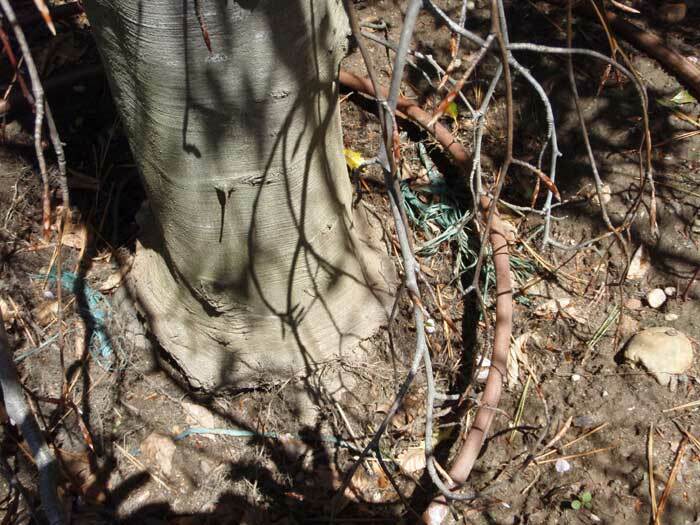 However, the picture on the left shows a tree that was planted with a blue burlap sack still intact as seen protruding from the ground. 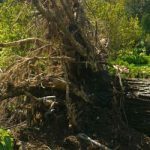 It is hard to find any property on Long Island that does not have at least one tree suffering from this problem. The lack of growth or the fruit-less seasons are usually noticed years after the tree has been planted, when the landscaper has long since moved on. The Air Spade uses an air compressor and a specialized air tool attached to it so that dirt and mulch can be blown away without damaging any of the roots, like a shovel would. This is the only way to see the entire root structure and properly diagnose a tree that shows no signs of growth. 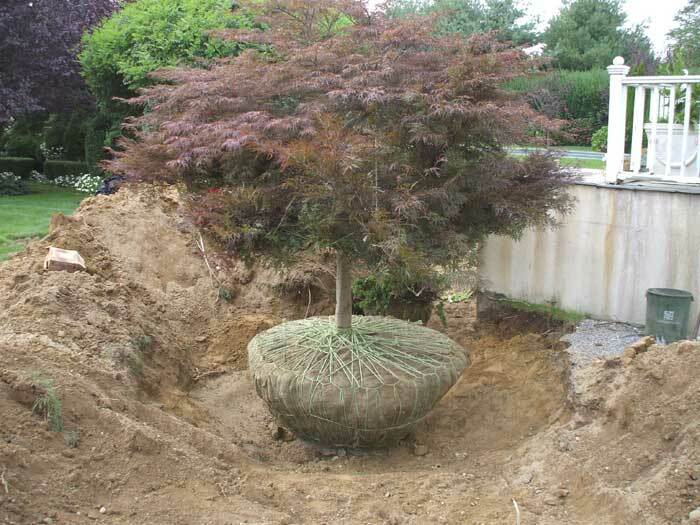 Included with every fertilization program is an air spading so that mountains of mulch can be blown away from the trunk of the tree, preventing fungi in the wood from attacking the tree and also identifying a tree that is still sitting in a wire basket. If these trees are left alone they will surely die eventually. Don’t wait – have a Board Certified Master Arborist inspect your property today.